Home > Our brand> Who are we ? Launched in 2004 by Delphine Mocher, trained hairdresser and owner of three hair salons, and her brother Bruno Mocher, with a previous 12-year career at L'Oréal, Generik is a thriving family business. Attentive to the needs of hairdressers, they have the idea to start a professional range dedicated to hairdressers on a simple formula: maximum quality, minimum price. The brand's vocation was from the beginning to create and develop an offer of essential and highly qualitative products at the best possible price. The investment focuses on product and service quality, minimizing all costs related to packaging, communication, training and distribution of the product. After starting modestly with a bleaching powder that immediately received a great success, the range was joined by shampoos and developers. Then, at the request of professional hairdressers, the ranges were gradually expanded with color, care and styling. This complementary approach to traditional brands continues to attract many hair salons. GENERIK continues to assert itself as a privileged partner of hairdressing salons. 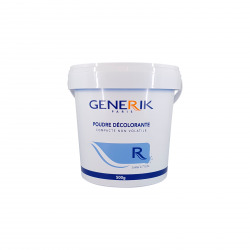 Generik has become the first range of professional products distributed in more than 15,000 hairdressing salons in France, whose products are recognized, developed and tested by hairdressers before each launch. Real key factor of the brand, we offer an unrivaled service to our customers. "Doing the same thing differently," is the credo of the company Generik, and the vision of the founders.